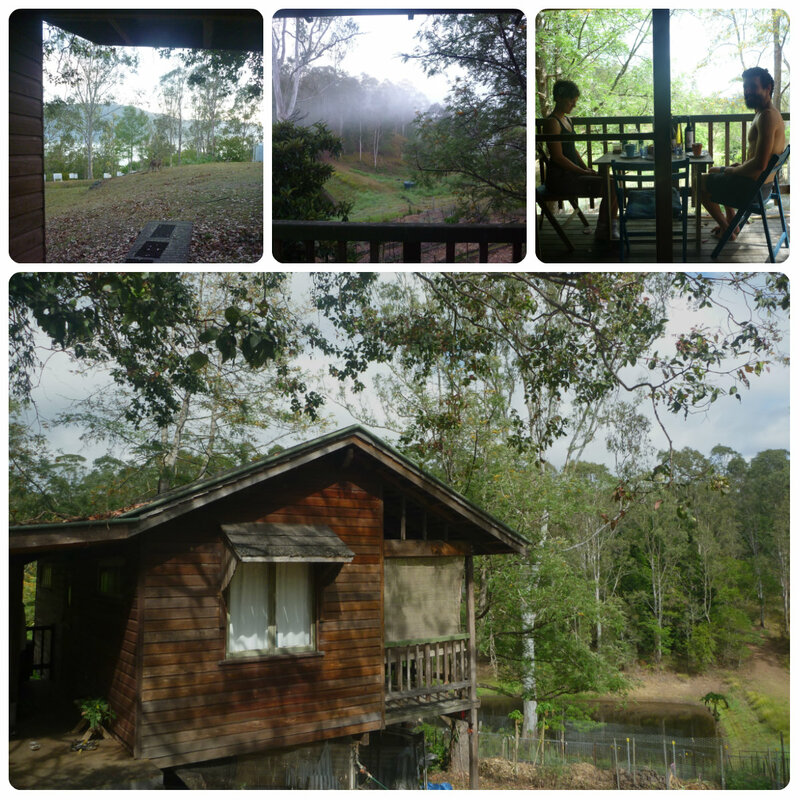 Next stop: Crystal Waters Eco Village in the beautiful Sunshine Coast hinterland of Queensland. For us, this was to be round 2 of WWOOFing, and a chance to visit family just down the road – my Dad, Step-mum and two sisters. Actually, they are the whole reason we went to Queensland. And why we even thought of taking the car and some extra time to see Australia on our way out – cheers to that! In the topographically endowed plot they have two garden areas, plus various plantings of useful trees for bees, birds and humans alike (such as the freaky but fun – and yummy – Jaboticaba). 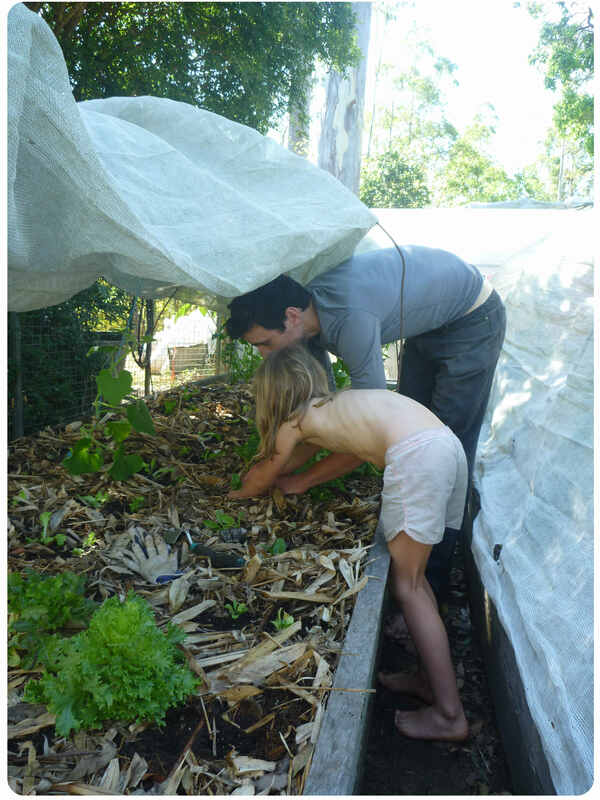 One garden is up high and close to the house with crops that require more frequent care, as in the permaculture idea of zoning (highest maintenance areas are placed close to where the labour is). Think greens and such: lettuces, herbs, spinach, onions, cucumbers, salad greens, tomatoes and flowers for companions. 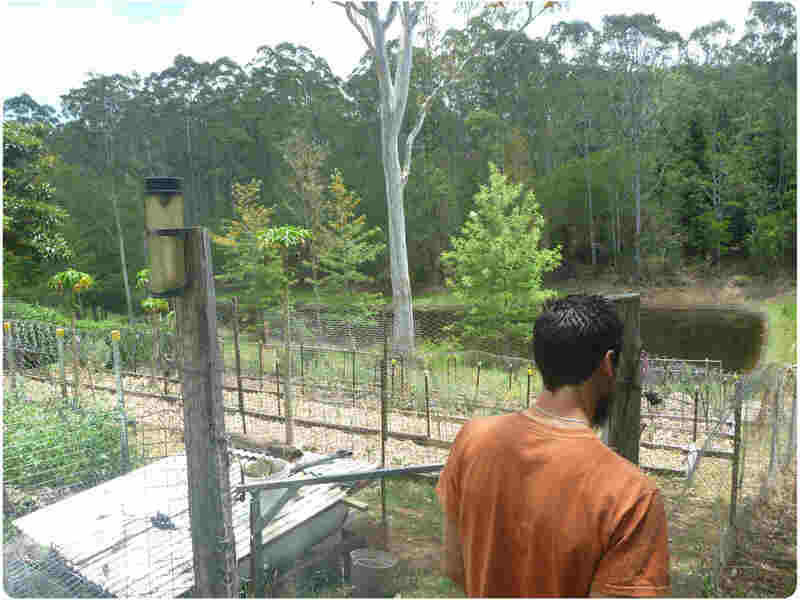 It was a good sized area with about 6 large raised beds sitting over a sandy base and plantings around the edge (another permaculture principle; value and use the edge – in this example it is taken literally in terms of space but one could also consider it more laterally in valuing ideas, people or products that are on the fringe). And just like at home, cherry tomatoes were proving to be troopers so we foraged lots from stray bushes to make many a tabouli bowl with the abundant parsley. Then the other ‘lower’ garden, as per its name, was located down the hill a bit. As you might guess, the less frequently visited crops were down here. At this end of spring it included the last of plants like broccoli, kale, cabbage and more onions and parsley. We partook in these too, then helped prep for new plantings in the five super long beds with some home grown chook poo and worm castings (aka, you guessed it – poo) for fertiliser. Turns out, moving wheelbarrows up and down the slopes was, deceptively, much harder than I expected – gardening on a hillside will keep you fit! Then we topped em’ off with locally abundant shredded bamboo for mulch and they were ready for the next planting – some of which we got to do before we left. We sowed peas and beans in time to see them raise their little heads and stretch leafy wings – I love seeing the birth of seedlings! Emma was prospering in the setting and lifestyle here too. 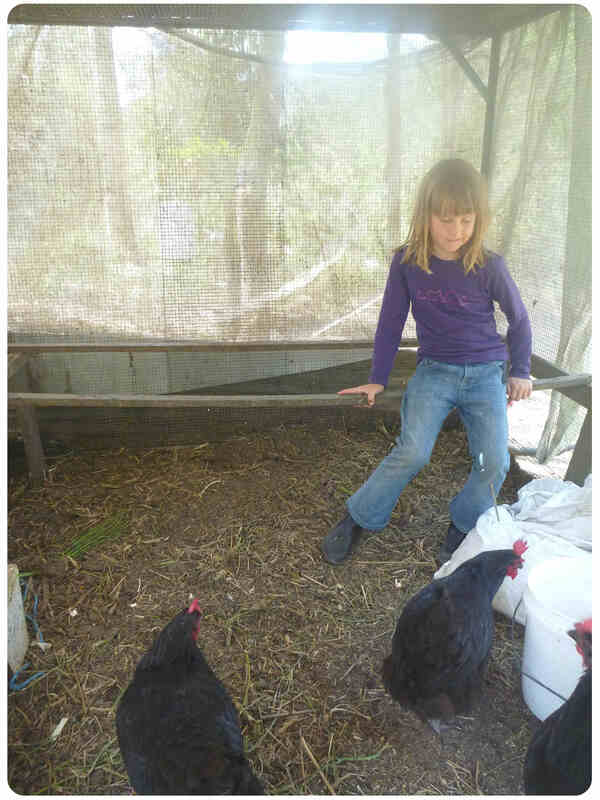 While on our own, she quickly settled into a routine of looking after the chickens by herself – ushering them in and out; checking water, grain and eggs; and dragging over spent broccoli. I say ‘dragging’ because, by this time, the broccoli stalks had grown to be pretty much bigger than her. We often found her taking solace in the hen house, just hanging out with the ladies. 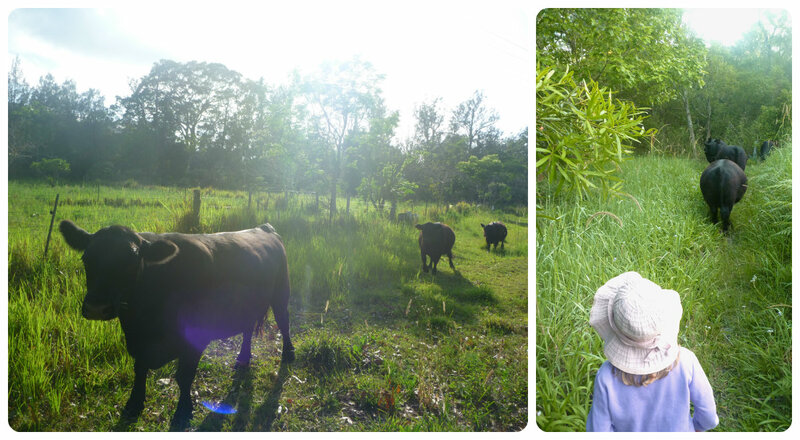 She really enjoyed having that responsibility – I think the morning and night animal chores punctuated her day. She also took to playing hospitality – ‘the tea party hotel’ as she liked to call it. She set up tables, took our orders, made food for real and even sometimes did the dishes after packing it all up! True to her independent ways, she was completely adamant that she must do it all. Well, it was her hotel I guess. In light of her enjoying this kind of service role, we took the opportunity to add a related responsibility – doing the breakfast dishes while Michael and I went out for another couple of hours work in the morning. Despite not being over the moon about it, she agreed, then volunteered to make the breakfast too, go figure! Seems the freedom to take responsibility and feel strong brings on a flourishing in her. I’ve yet to mention our accommodation – a beautiful swiss style chalet. And when I say Swiss chalet, in sunny Queensland, I don’t think its a joke. Max is actually Swiss. Picture a wooden cabin with two bedrooms, decks, central lounge and kitchen, viewing the Northern woods and dam. We certainly felt spoiled – even Ruby got a bed! 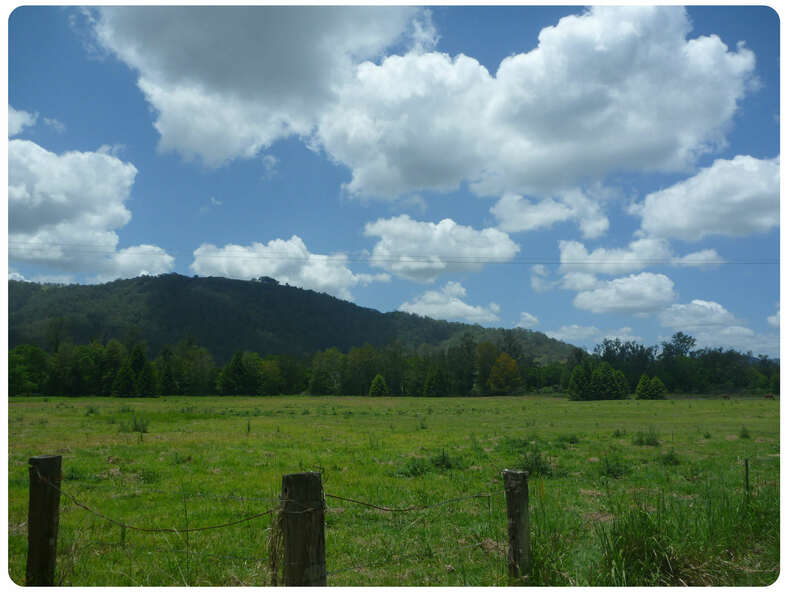 And as for the village’s landscape, Max & Trudi’s lot sits within the 640 acre bush property – 14% of which is allocated to residential land. The rest is owned in common – as preserved bushland mostly, plus commercial land (the village green, commercial kitchen & deck venue, other business space/ventures, paddocks and an eco caravan park). A body corporate, community co-operative and sub committees manage the public facilities and village green activities. The property is a wildlife refuge and so a no dog/cat policy is in place to protect the diversity there. 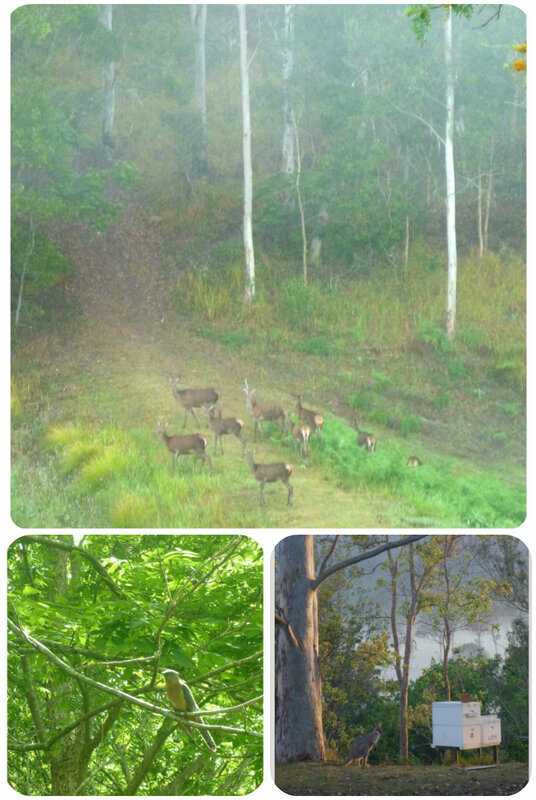 And diversity abounds – as do the kangaroos and wallabies that frequented our cabin and the gardens every day. Literally. Plus deer – not as often or as close, but not far enough away for a gardener, hence the wildlife-proof fences which surround the edible plantings. Birds, frogs, butterflies and snakes also visited us. And spiders, lots of spiders. But after daily clearing of webs, and nightly refilling, you just let it go and get used to it. Throughout the village are dams, ponds and a sparkling, rocky creek – containing fish and even platypus. It certainly is a beautiful slice of bush that seems to succeed at incorporating refreshing environments for humans and wildlife alike. Then early one morning we met Max – up with the sun, as he is everyday. I think he was a little surprised to see some WWOOFers doing the same. Lovely man – matter of fact and warm. Not long after we met Trudi – working diligently in the bee house and equally lovely, exuding what I think of as a typically wonderful country disposition: equal parts down-to-earth frankness and friendly hospitality. Then, the bees – oh the bees! This was our first introduction into bees and beekeeping. Scary and captivating is how I want to describe the experience. The gentle calmness Max demonstrated seemed an essential qualification for checking the hives and collecting honey. For that reason I donned a bee suit but mostly watched while the born-calm Michael learnt the ropes. Fascinating – I would love to have a go one day. 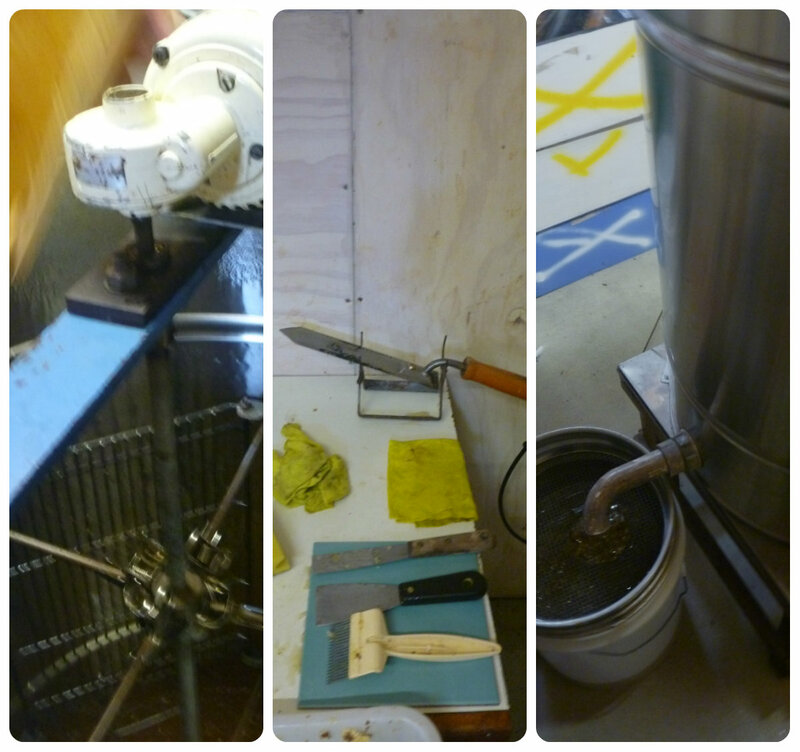 For now though, I headed in to help Trudi with the processing. Sticky fun sees waxy caps of the honeycomb taken off frames with a heated knife, followed by spinning to release the honey. Then it just goes through a series of mesh filters and into a bucket. Voila! Simple, and such a bonus that honey keeps just fine at room temperature and is naturally anti-bacterial – great product to work with. While Max and Trudi keep bees and sell honey as a business (Crystal Waters Raw Honey), I suspect that for them, as for others, its about more than just honey and money. Watching Max with the bees was like watching someone in pleasant ritual. In mediation. Not to mention the importance of helping to sustain a healthy bee population – both for their own sake and ours. In case you’re uninitiated, bees are responsible for pollinating, and therefore producing, a significant chunk of our food. As well as who-knows-what other valuable roles in the eco-system. Seems they are having ever-more trouble from disease, habitat/food loss and our increasing use of chemicals in agriculture. The American (aka Californian) almond industry is a great case in point. The sect has turned over massive tracts of land to almond trees – and usually only almond trees = massive monoculture. They rely solely on bees to pollinate their crop and turn blossoms into almonds, but there aren’t enough bees around naturally, (i’m thinking it’s pretty hard to live in a place with only one food at one time of year), and so they truck them in seasonally from all over the country. Increasingly though, more bee deaths are occurring after the event and across the country in general (the mysterious, cause-unknown, syndrome is being called ‘colony collapse disorder’). And it looks like the chemicals the growers are using are also a contributing cause. It got so bad that they had to ship bees in from Australia! Can you believe it? I was shocked, having no idea they did that. I know what we’re like after such a long trip – I can’t imagine it does the bees any good either, never mind the resources that go into the transportation and quarantine issues. Turns out quarantine issues did emerge and the risk of foreign disease/parasites from our bees caused the US to put the Kibosh on that option. Looks to me like plugging a badly designed boat with ever-growing wads of bubblegum. As for a solution, well in my opinion, it seems it might just be the same as what we need – diversity of clean food. We don’t do well eating the same thing endlessly, nor living in a food desert or consuming processed/chemicalised (yes, I’ve now made that a word) food. Neither do they. So plant something else with the almonds, its not hard (unless the system is set up to be a large scale mechanised factory in a field…). It’s just another reason to support the growers using more responsible and sustainable practices – i.e. without the chemicals and mass-scale. Ok, I’m back from ranty-town. Shall we continue? Snigger. A lesson followed on the, suddenly relevant and contextualised, meaning of a ‘herbivore’. In addition, Max & Trudi also have an orchard of kaffir lime trees and work on their other business in environmental consulting as well as a non-profit which encourages and educates in the area of communities and eco-villages. So a day’s work on such a property can cover tasks in many areas. To paint a picture of our WWOOFing days though, think of time spent in garden beds working the soil with natural amendments, weeding, planting and watering, as well as tying cucumbers and putting the ingeniously simple shade cloth covers in an infinite number of configurations, according to the days weather. 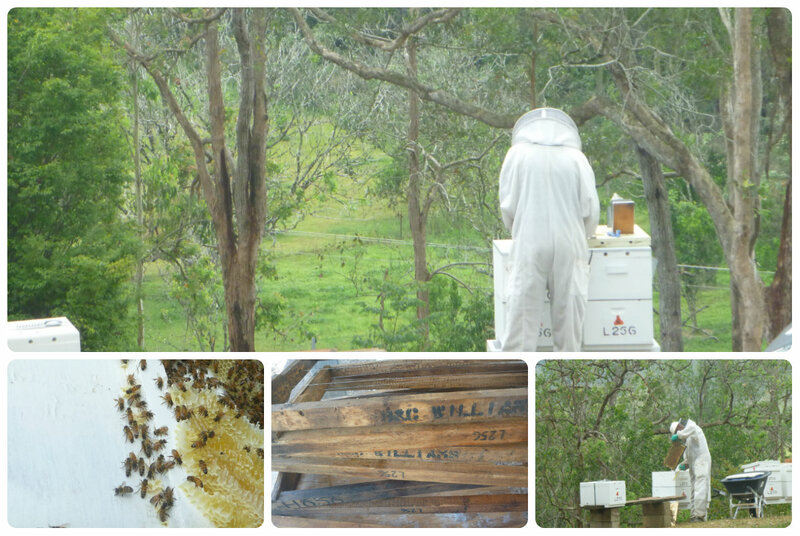 Then other tasks were decidedly bee orientated – helping to check, clean and collect from hives and process the honey. Emma enjoyed watching and helping with the bottle labelling too. And I think we all enjoyed getting a good dose of woodworking when drilling, hammering, nailing, gluing and wiring up new bee frames was required. 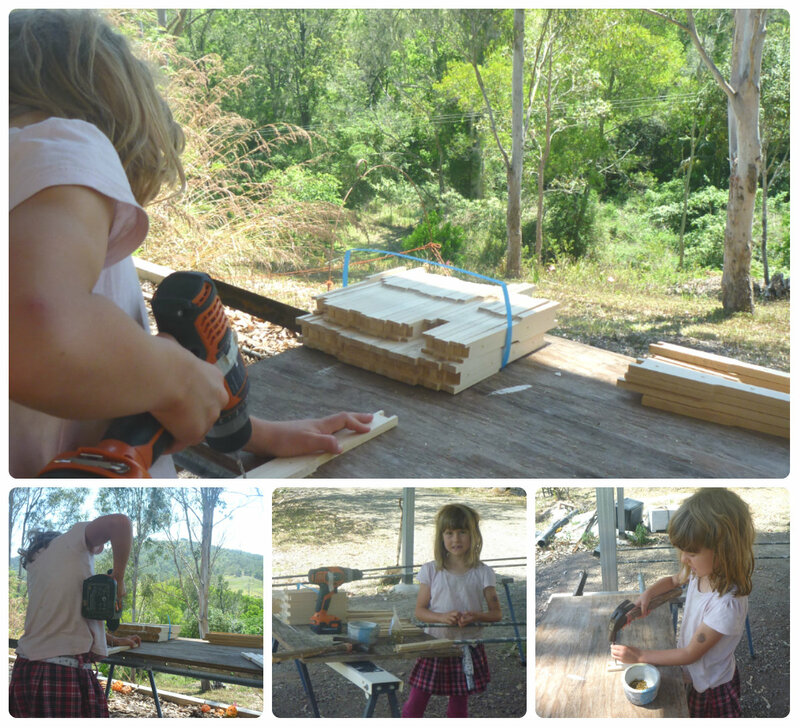 While Emma was busy learning to use the electric drill and hammer in eyelets, I made a comment about this being a woodworking lesson for her, but despite my best efforts she didn’t believe me. Oh well, apparently those skills belong in some other category! We also went to one of the local markets at Witta to help set up Max & Trudi’s stall, which adjoins that of Pat and Johns – they recently bought the Lindegger’s long held seedling business. They were a great couple of stalls in what was a lovely example of a country market, selling lots of great local, sustainable produce. In amongst the work hours – which can be a flexible arrangement by the way – we tried to get involved with some of the many activities going on. Most days we would wake up early to do a couple of hours then do another couple after breakfast or leave it until the afternoon. We also did more on some days so we could organise larger allotments of free to time for excursions. The type of work schedule depends upon the host and the work they have going – but from what we have seen and heard, most hosts are more than happy to be flexible and give WWOOFers encouragement, time and help in getting to know the area and people. It’s a sharing platform after all. Well, at Crystal Waters there is so much to see, do and join in with that we tried our best to take advantage of what we could. For example, Every Saturday in the village green their organic, handmade sourdough bakery opens up to serve it’s bready delights, plus morning sweet treats and coffee. The second hand shop located across the way also opens and people can mill around, sit on the outdoor tables and chairs or shelter up on the deck. People come down for their weekly bread, some stay for a cuppa and chat, or many with kids come down to socialise while the children amuse themselves with the play equipment and each other’s company. 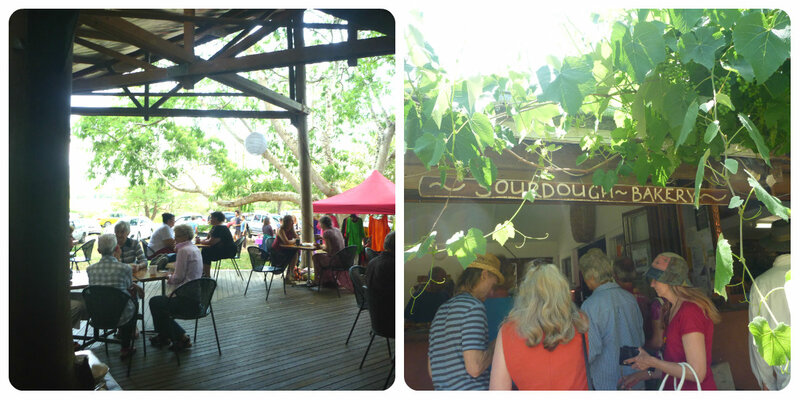 Its a lovely, relaxed atmosphere where people are happy to linger and socialise. In contrast, on the first Saturday of each month it grows into the Crystal Waters Market where you find a busier, lively atmosphere. In addition to the bakery and second hand shop, there is live music and vendors selling an array of things like second hand goods and foodie items (ranging from fresh produce and ready to eat yummies – think home made pies, curry, sorbet, real lemonade and juices – to more specialty stuff like kombucha). And the commercial kitchen and communal cafe on the big deck opens up too. Thats just the tip of the iceberg though. Every friday night there is a movie on in the Eco Centre, followed by the bakery saturday-moning-social (as i’m calling it) and then usually a saturday night show of some sort – we caught a comedy performance when were there, great fun. 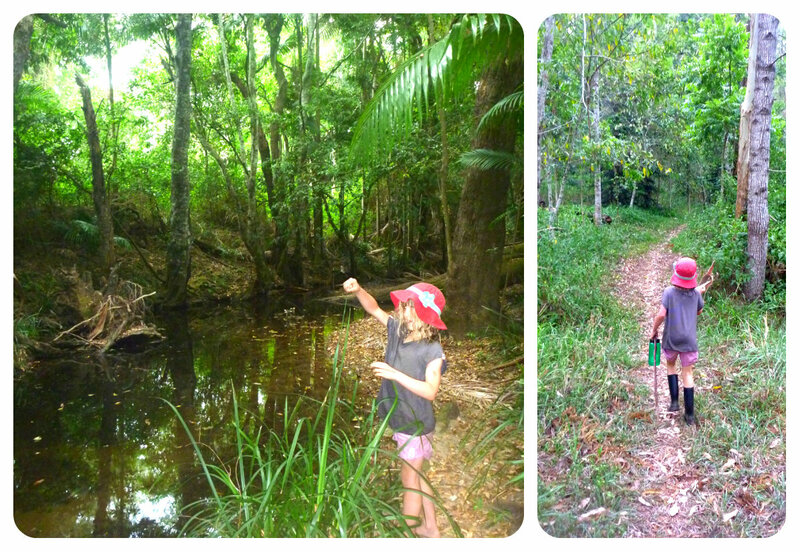 Then on Sunday morning they shake it all off with a bush walk in the property or surrounding area. After the bush walk I joined in some of the other happenings during the week – like taking Emma to the community choir (thought she might find it fun) only to have her abandon me for a new friend – well! It now seemed I was there to join the choir – nothing left to do but try and sing. Not to worry though, I found it was so much fun I went back the next week! And it was of course great for Emma – she and Ellenie had a wonderful time. We even organised to come back for another play date. Then we all went along to watch the Marimba band practice. If you’re not familiar with the marimba, imagine a mutated wooden xylophone-like creature big enough to have its own legs and stand at an adults waist. Now imagine several of them in one room with players beating in time and tune. On arrival we were given instruments and an apologetic forewarning that they may not be right on top of things – it had been a little while. The instruments were great fun, the sounds jubilant and the warnings unnecessary – we enjoyed every minute of it, especially emma who surprisingly found a comfortable home and rhythm upon the drum. So the activities were great and we had a blast, but what we enjoyed most was meeting the people. The chance to meet, chat and connect was invigorating and I enjoyed hearing other’s perspectives on all sorts of topics, including the village. 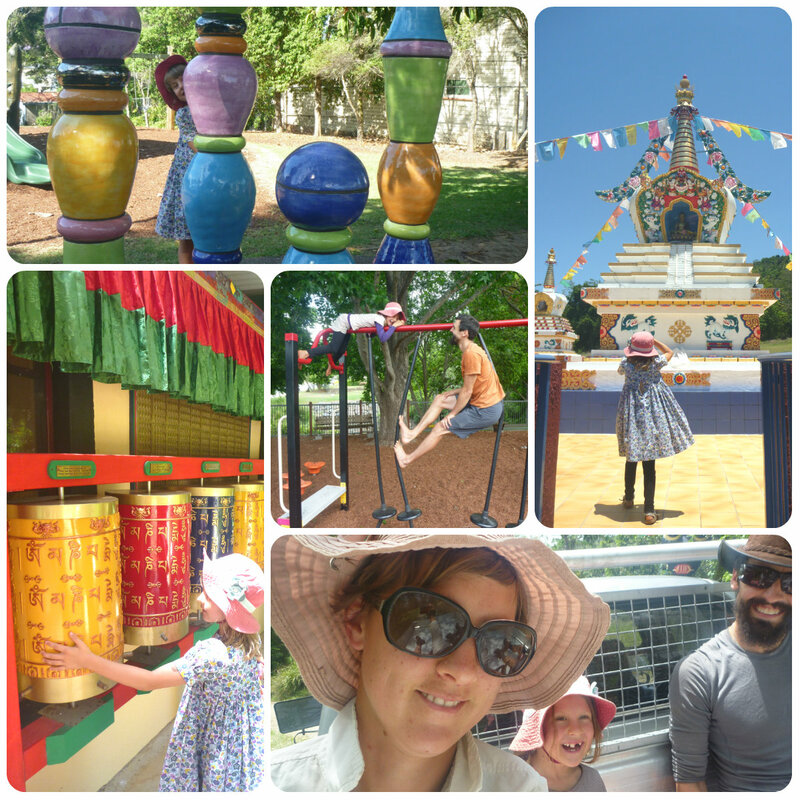 We spent the rest of our free time visiting our family, relaxing in the cabin, chillin down at the creek or exploring places outside like nearby Maleny, Ananda Marga River School, Manduka Coop Community and Chenrezig Institute Budhist Retreat (all of which, were very rich and interesting in their own ways). Looking back, I think of the mixed messages we got about this place. It’s reputation as a worthy model is based on the fact that it’s been around for about 30 years, is still going and was the first permaculture eco-village ever designed in the world – not to mention the leading examples of sustainable buildings which can be seen there. Yet, the village seems to suffer from a different reputation in some parts of the greater area – with negative hippie-type stigma or insinuations that things there aren’t working. When we talked about going there to see an illustration of a good intentional community, we received discouragement – the source of which I suspect lay in mismatches of expectations or the natural frustrations & challenges which are present in managing that amount of land and people. Later on, Max (who also co-designed the village) chatted to us about the issue too, saying people often expect the village to be one way or another. For instance, everyone getting along or thinking the same way, all being into some healing or spirituality, or that the place would be dripping with food. He added that in reality, expectations are often wrong and the village just is what it is – about 200 people co-living in an area with the accompanying diversity one might expect of a group that size. But in the face of the initial contradictions, we decided that whatever the actual situation was, we could learn from it. Examples to emulate are just as powerful as examples to avoid. And I’m so glad we did – what a rich experience we had. While we may not know all there is to know after seeing it for a few weeks, it’s still true that we were actually there. We met people, got involved and saw it for ourselves. We saw that there are challenges to be worked through, and trade-offs for the lifestyle – but I think that’s the case anywhere. More importantly, we saw why is the villager’s have decided the up-sides and positives outweigh them – we saw a place where the land and environment are respected, where people come together for activity, joy and in need. And where a healthy lifestyle can flourish. As a result, we have real admiration and respect for the village and what they have done/are doing there. The continuing journey ahead will be an interesting one that we wish them all the best for, and hope to hear more about. Lastly, we are grateful to have met the people we did – it was such a pleasure. And particularly to our hosts Max & Trudi for their open and sharing spirit – thank you for the opportunity and conversations. We took a lot away from our time there – we hope we also left a little piece of ourselves behind….